Xanthelasmas are localized accumulation of lipid deposits on the eyelids. Lesions are typically asymptomatic and treatment is often sought for cosmetic purposes. Unfortunately, there is paucity of strong evidence in the literature for the effective treatment of normolipidemic xanthelasmas. A literature search using the term “xanthelasma” was carried out in PubMed and Medline databases. Only articles related to treatment were considered and analyzed for their data. Commonly cited treatments include topical trichloroacetic acid, liquid nitrogen cryotherapy, and various lasers including carbon dioxide, Er:YAG, Q-switched Nd:YAG, and pulse dye laser. However, traditional surgical excision has also been used. This article reviews these currently accepted modalities of treatment. Background: Keloid is an abnormal growth of scar at the site of skin injury, which usually does not regress. It proliferates beyond the original scar. The ear keloid usually develops after piercing injury to wear ornaments. A patient usually asks for removal of keloid, as it is aesthetically unpleasant. Patient may sometimes complain of itching and pain. Aim: The study was conducted to analyze results following excision of keloid with its tract and topical silicone gel as the postsurgical adjuvant. 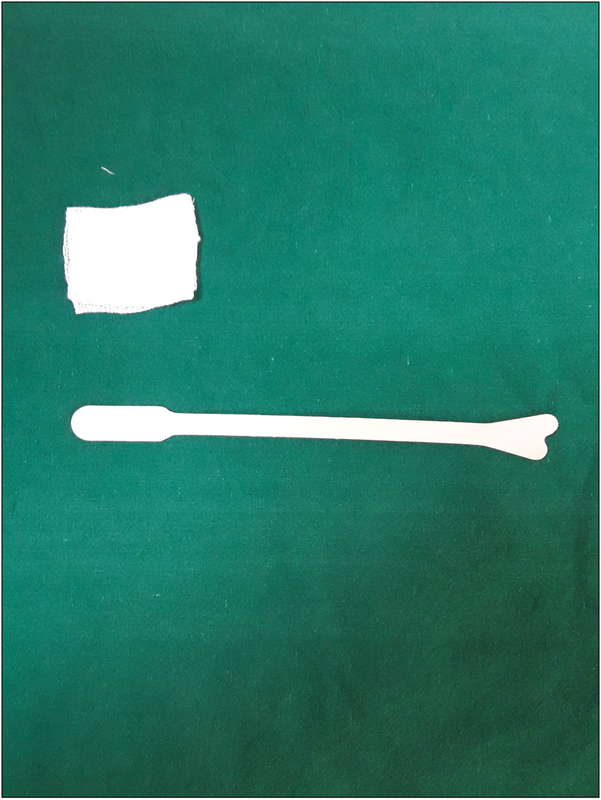 Materials and Methods: Ear keloids measuring less than 0.5cm or more than 5cm in maximum dimension were excluded from the study. Nonpiercing causes such as burns, trauma, and recurrent keloid were excluded from the study. 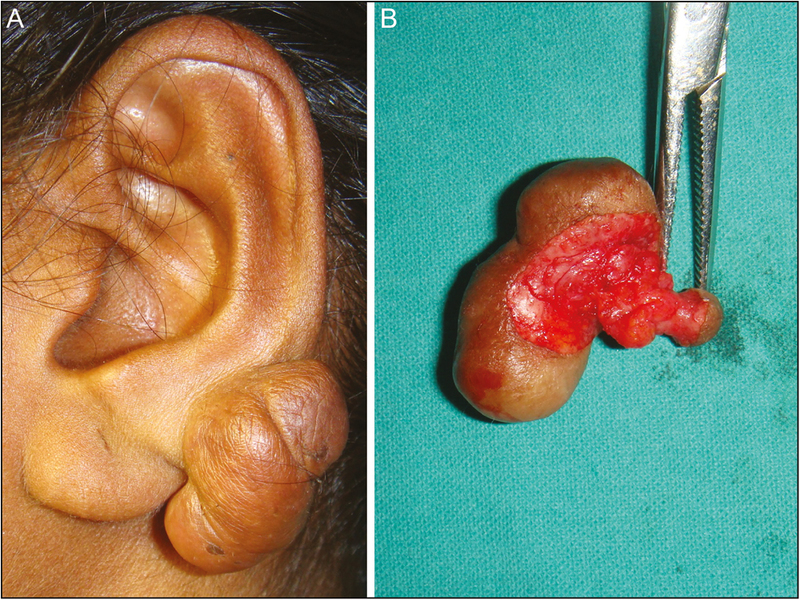 The study was carried out on 22 patients who had keloid because of piercing injury, including 4 cases with both ear keloids. Of 26 ear keloids, 19 had the tract or connecting tissue. The lesion was excised under anesthesia using magnification. 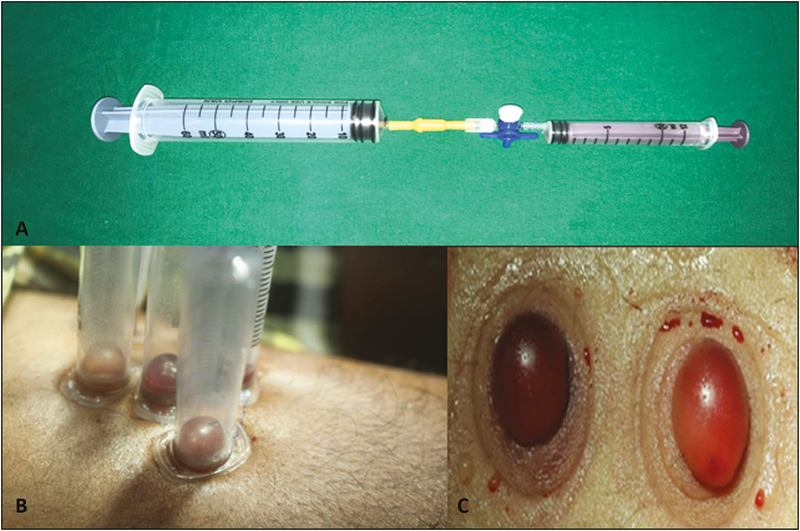 For all the operated cases, topical liquid silicone gel was used as postsurgical adjuvant therapy. 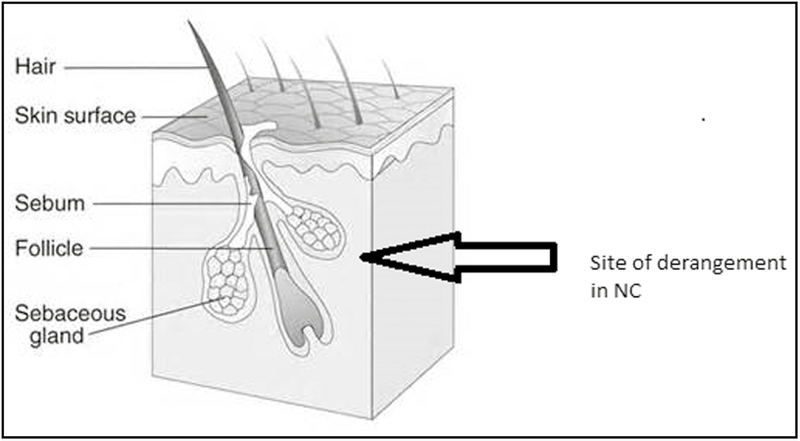 The method of application of topical silicone gel was taught to each patient and was considered significant. Result: The magnification helped in identification of tract in 73% of the cases in this study. 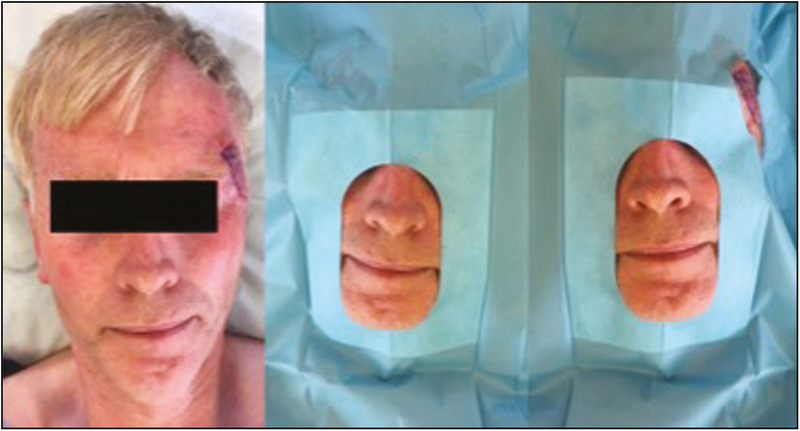 Twenty patients had successfully responded to proposed treatment, and two patients developed recurrence while using topical silicone gel as the adjuvant. 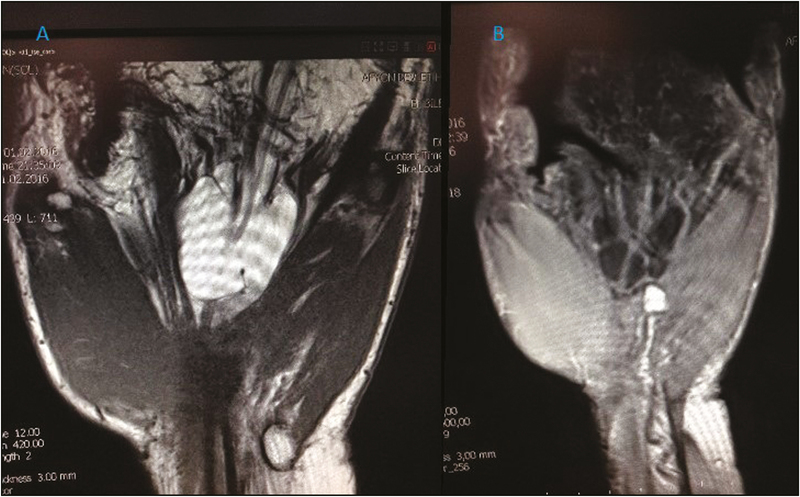 These two patients were managed with conventional triamcinolone injection. 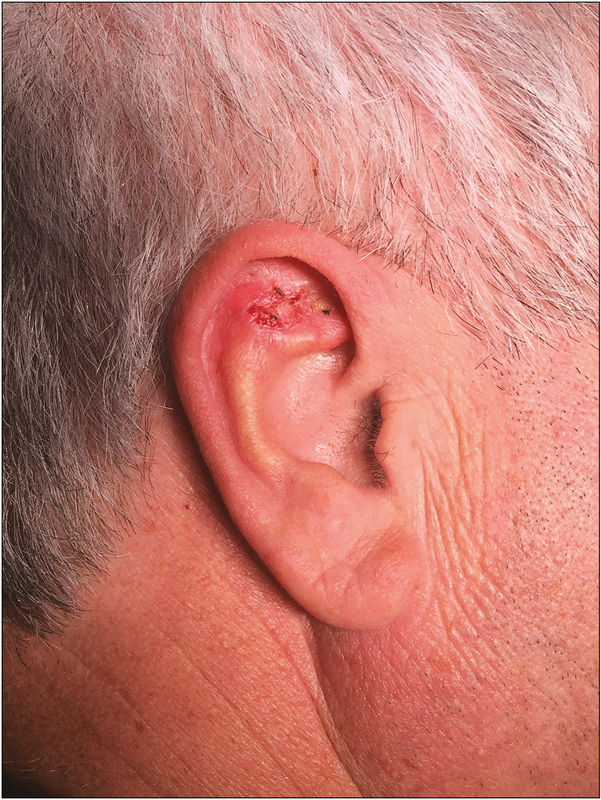 Conclusion: The topical silicone gel as postsurgical adjuvant therapy avoided the use of painful postsurgical injection or radiotherapy for the 1–3cm primary ear keloids. The advantages of magnification were better clearance of keloid tissue, easier identification of tract and removal of keloid pseudopods, meticulous suturing, and comfortable elevation of a small local flap. Background: Lip vitiligo is usually resistant to medical modalities of treatment, and in all these cases, surgery offers a hope. Suction blister grafting (SBG) has been tried since long for lip vitiligo with high rate of success. There have been no long-term follow-up studies of patients with SBG at a difficult-to-treat site like angles of lip, which prompted us to conduct this study. Aims and Objectives: To assess the pigmentation rate and patient satisfaction of SBG on vitiligo involving angles of lip. Materials and Methods: This is a prospective study conducted on 112 patients with stable vitiligo involving angles of lip. SBG was carried out in all the patients using the standard procedure. Patients were advised to apply topical psoralen followed by sun exposure (PUVASOL) for 8–12 weeks after operation. The patients were followed up at 3, 6, 12, 18, and 24 months for assessment of pigmentation and overall satisfaction. Results: We found a pigmentation success rate of 83.7%, 84.9%, 85.7%, 78.3%, and 77.8% in the patients who were followed up at 3, 6, 12, 18, and 24 months, respectively. A total of 77.8% of patients who came for follow-up at the end of 24 months were very happy with the treatment. Discussion: Our data show clearance of vitiligo and persistence of pigmentation gained through SBG in 77.8% of cases at the end of 2 years as well as excellent patient satisfaction in the cohort of patients who followed up with us. Conclusion: SBG is an easy and cost-effective way of repigmentation of vitiligo involving angles of lip. Introduction: The Er:YAG laser, considered to be less effective than CO2 laser in its traditional form, in its new modulated version has variable pulse technology that is claimed to be superior to the earlier versions of the laser. 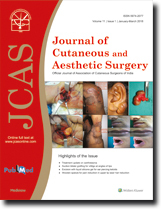 Aim: The aim of the study was to check efficacy and safety of the new variable square pulse (VSP) Er:YAG laser in the management of acne scar in patients with Fitzpatrick skin types IV and V. Materials and Methods: This retrospective study consisted of 80 patients (Fitzpatrick skin types IV and V) with atrophic and hypertrophic facial acne scars. Records of the patients who had undergone four treatment sessions with VSP technology equipped with Er:YAG laser were extracted. Each patient had undergone a minimum of four sessions. Fractional mode at medium laser pulse (SP) and long pulse (LP) was employed for the depressed center of the scars to stimulate neocollagenogenesis. Short laser pulse (MSP) in nonfractionated mode was used for ablating the raised scar border and hypertrophic scars. Goodman and Baron global scarring grading system was used for qualitative and quantitative assessments. Patient’s satisfaction to the treatment and observer’s assessment of improvement (based on photographs) was graded as poor (<25% improvement), fair (25–50% improvement), good (51–75% improvement), and excellent (>75% improvement). Results: At the end of the four sessions, the number of patients in grade IV postacne scarring reduced from 16 to 2 and that in grade III from 47 to 29. The mean score significantly dropped from 36.94 to 27.5. Subjective assessment revealed that 78 of 80 patients had noticed more than 25% improvement, with 50 of them showing more than 50% improvement at the end of four sessions. Eight patients perceived an excellent response and 42 reported a good response. This is notably higher than the observer’s grading, which showed an excellent response in only 2 patients and a good response in 35. Adverse effects were limited to prolonged erythema (two patients), prolonged crusting (one patient), and postinflammatory hyperpigmentation (one patient). Conclusion: Ninety-seven percent of the subjects in our study perceived at least a fair improvement. We also saw a significant change in the objective score with a fall of the mean quantitative score from 36.94 to 27.15. This underscores the new variable-pulsed Er:YAG laser’s effectiveness in the treatment of acne scars. It also has the added advantage of lesser adverse events and faster healing. Scalp surgeries are some of the surgeries frequently performed in dermatosurgery department. These surgical procedures may leave large defects, especially when performed for malignant condition in which wide margin has to be excised. Such large defects are difficult to close primarily when reconstruction with local flap is essential. Here we report a case of epithelioid angiosarcoma of the scalp in a 24-year-old man where excision and reconstruction were performed using triple rotation flap. Carpal tunnel syndrome can be the result of a wide variety of etiologic factors. Compressive causes are rare and tumors causing compression are even rarer. We present a case with a carpal tunnel syndrome caused by an intraneural lipoma and an arteriovenous malformation concomitantly. The lesions were excised, and the patient recovered with full hand function and entire disappearance of acroparesthesia. To our knowledge, this is the first case report of carpal tunnel syndrome caused by an intraneural lipoma and an arteriovenous malformation concomitantly. Nevus comedonicus is a rare epidermal abnormality of the pilosebaceous unit, which is congenital in most patients but may also appear early in childhood. It may be localized or have an extensive involvement, the latter showing a unilateral predominance with only a few cases presenting bilaterally. Extensive nevus comedonicus can be associated with musculoskeletal defects, eye and neurological involvement, which constitutes nevus comedonicus syndrome. Uncomplicated nevus comedonicus can be treated with topical keratolytics, diode, erbium laser, and ultrapulse CO2 laser. Surgical excision can be performed to ensure complete removal and nonrecurrence. 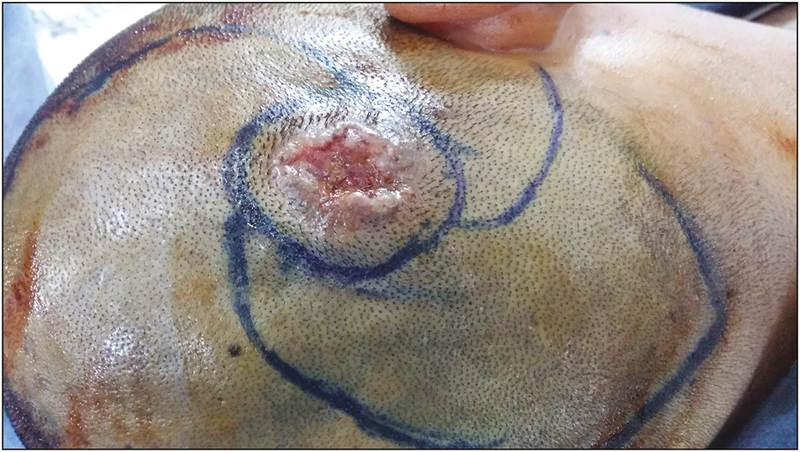 This case report refers to a young male patient with extensive nevus comedonicus present over left chest, left axilla, and left upper back without systemic involvement, treated with staged surgical excision and resurfacing.